RMS Creator generates random map scripts (.rms files) for the real-time strategy game Age of Empires II: Age of Kings/The Conquerors Expansion. - Monitor display resolution of at least 800x600. Does the world really need another random map scripting program? There are a few others available already, some better than others, and I applaud the authors for their efforts; however, each existing program I've tried I felt that either it was missing important features and options, or it had too many bugs to work properly. Unsatisfied, I wanted to make a random map scripting program the way I imagined it should be. To make a flexible, powerful, yet user-friendly random map script generator. 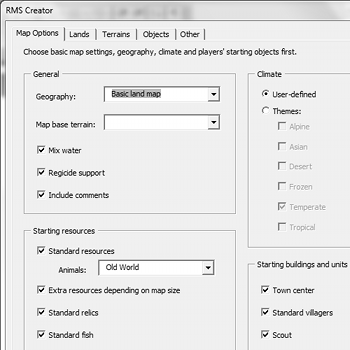 Beginners or casual random map scripters can use RMS Creator to make basic map scripts with little or no knowledge of the scripting language. If you are a random map script expert, you can make a map script with RMS Creator and then tweak the code to your liking. RMS Creator is a great programme which allows an RMS scripter to create a random map quickly and easily. It is great for a beginner and is very simple and easy to use. The RMS Creator can create any random map with a few clicks. It has simple and easy instructions and is the perfect programme for a beginner. This is the best thing and RMS scripter could wish for. I see you've updated this, and now it seems to work in the newer versions of word (after enabling macros). I will be updating the various guides where I previously said that this did not work for Word 2007. Is it usefull for AOEIII?